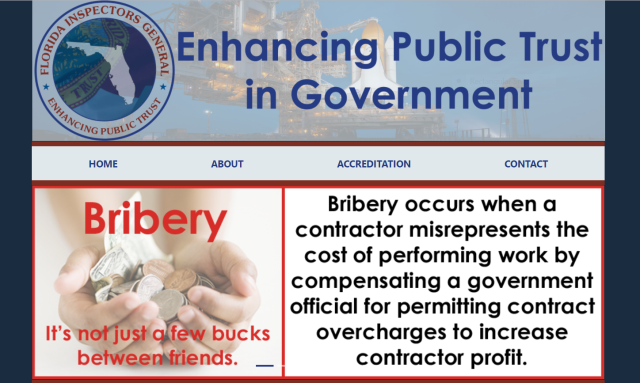 The image above is a screen shot from the Florida Inspectors General website. Is the Florida Keys Society for the Prevention of Cruelty to Animals (FKSPCA) over-charging the taxpayers to run the Marathon shelter? Sure looks that way. Are county officials benefiting somehow? There’s no smoking gun, but documents that would shed light on how much it cost the previous operators to run the shelter are mysteriously unavailable. And the state attorneys office has made it abundantly clear they cannot be bothered to properly look into the matter. Where does that leave the taxpayers? Twisting in the wind. That’s where. And so the animal control drama continues. A suspicious procurement process, inflated costs, stories that don’t add up, frantic efforts to suppress questioning, disappearing public records, law enforcement officials who look the other way. Here’s a good place to catch up on the back story. In order to gain some clarity, I submitted a public records request to Assistant County Administrator, Kevin Wilson, and County Attorney, Bob Shillinger. Here’s a link to that dialog. Wilson, apparently, delegated the job of responding to my request to a staffer who claims she has been unable to locate the most important of these documents, documents which should be readily available. That frustrating dialog, along with the FKSPCA’s profound ignorance, made me wonder if county staff or contractors have any clue as to what their responsibilities actually are when it comes to handling public records. So I asked Bob Shillinger for policy and/or training documents used to inform county employees and contractors. Here’s a link to that discussion. And here’s a rundown of the status of the documents I requested. Audited financial statements from SHARK (2011-2015) – 2011, 2012, 2013 received; 2014 and 2015 still missing. Documents related to Monroe County’s efforts to ensure that employees and contractors comply with Florida’s Sunshine Law. The 2014 and 2015 financial statements from SHARK would come in extremely handy in order to verify (or refute) FKSPCA’s claims about the true cost of running the Marathon shelter. I find it very strange that the county can locate older financial statements but can’t find the two most recent and important ones. This also raises the question of what due diligence, if any, was done before the county awarded the contract to FKSPCA at the inflated price. Good old Bob Shillinger provided several documents that establish that he, at least, understands the requirements of Florida’s Sunshine Law, and has conveyed that knowledge to county contractors and staff. That makes it very difficult for folks to claim ignorance of the law. At the end of the day, if law enforcement chooses to turn a blind eye, then the taxpayers are without protection. The state attorney is the weak link in all this. Bob can write his memos and make his presentations about the Sunshine Law, but if nobody enforces it then who cares? It’s just performance art meant to dupe the public. County officials can do (or not do) whatever the hell they want because there is no accountability. As soon as I hear something more, so will you. Note: This article was first published February 3, 2018 on Margaret Blank’s blog. You can follow Margaret’s blog at: http://therealpoop.com. Strong work, Margie! As a Monroe County tx payer,I applaud your concerns regarding this latest scandal!